Hardly anyone thinks that clams changed the world. Most are benign, industrious critters toiling away in the sand or resting quietly in the sea. If we do consider them, it’s mostly because many are edible and some produce valuable, nacre-coated irritants worn as fashion. Perhaps the most famous bivalve in the world is the one that supports Venus in Botticelli’s legendary painting, The Birth of Venus. Botticelli depicts the Roman Goddess of beauty and love using the shell as a mode of transport as she arrives on land, blown by the winds. Although unrealistic as a way to travel, Botticelli’s shell does fit the classic image of a bivalve, something trod under foot. Thus some find it odd that a bivalve, in particular a much smaller clam than the one that carried the lovely Venus, was seminal to the early history of colonization of North America. Carolina governor James Moore was the first to discover the power of the clam when he lay siege to the Spanish town of St. Augustine, Florida, in 1702. 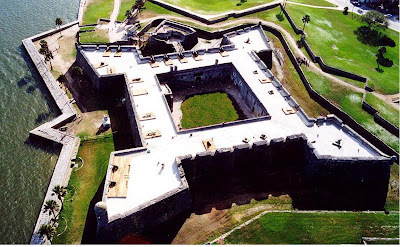 Moore attacked St. Augustine with 800 men, which forced all of the town’s residents into their recently completed fort, known as Castillo de San Marcos. For six weeks, Moore bombarded the Castillo, but with no luck. Cannonballs either bounced off of or stuck in the fort without breaking the walls. What was the miraculous building material? 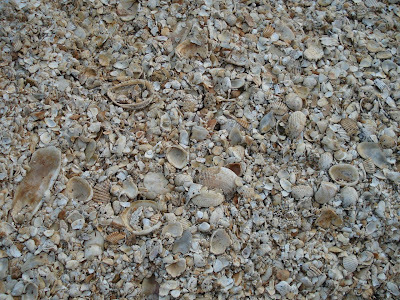 It was an unusual variety of limestone called coquina (Spanish for “little shell”), which outcrops along the northern Florida coast. 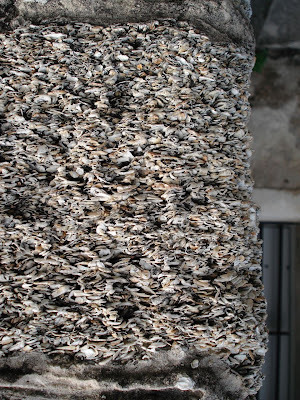 It formed 110,000 years ago as billions of bivalves accumulated on beaches. By far the most abundant bivalve is the coquina clam, Donax variabilis, the clam that changed the world. Moore eventually abandoned his nefarious plans and retreated back to Carolina. Thirty years later the English tried once more to take St. Augustine. Again they failed because of the coquina, leading one British soldier to express “[it] will not splinter but will give way to a cannon ball as though you would stick a knife into cheese.” Without the clam, one can argue that the English would have succeeded in invading St. Augustine, driven the Spanish out of Florida, and who knows how the world would have turned out. But because of the clam, no armed force ever took St. Augustine. The Castillo still stands, a wonderful tribute to the power of stone to influence architecture, history, and politics.